The 4 Tent Card Frames use similar cabinet-card-esque window shapes as those used in the December 2018 kit (and related shadowbox lids), but the windows have been resized to be used as ATC frames (on tent cards that can fold closed for mailing or storing). The windows are about 1/8" smaller than an ATC on each side (an ATC is 2-1/2" x 3-1/2"). Note: the outer "tent card" part (that has a flap and can close like an envelope or be flipped around to be a "tent stand" is the same for all 4). Only the inside card "overlay" with a window cut-out is different for each of the 4. You can attach the overlay on just 3 sides (leaving the top open to slide a photo or ATC in/out). Or you can glue is down permanently (or some other configuration... heaven knows someone will paper-hinge it on one side and it will open like a door to an entire world inside). One set (2 pieces of chipboard: 1 scored tent card and 1 overlay). 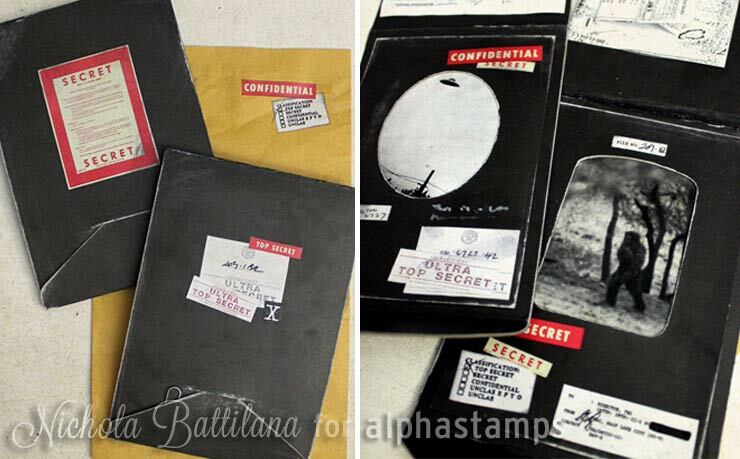 Design Team Member Nichola Battilana made The truth is out there - Confidential Top Secret Files (see the wide photo below). More info in the blog and/or see the supply list.